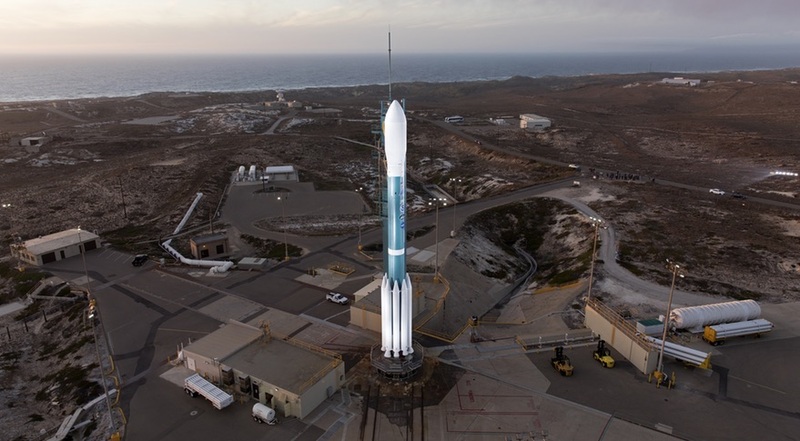 WASHINGTON — Firefly Aerospace, a small launch vehicle developer, has won approval from the U.S. Air Force to take over a launch pad at California’s Vandenberg Air Force Base used by the soon-to-retire Delta 2. In a May 1 statement, Texas-based Firefly said the Air Force had issued a “Statement of Support” to transfer Space Launch Complex 2 West (SLC-2W) at Vandenberg to the company for use by the company’s Alpha and Beta launch vehicles. SLC-2W, which has been in service for more than 50 years, is currently used by United Launch Alliance’s Delta 2 vehicle. That rocket is slated to make its final launch this September, carrying NASA’s ICESat-2 Earth science satellite. He said that the company expects to maintain much of the existing infrastructure at the site, with “minimal rework” needed to support Alpha launches. The biggest changes, he said, will involve the installation of a launch pedestal for the vehicle’s transporter erector, which rolls the vehicle out horizontally to the pad and then raises it vertically for launch. There will also be refitting of fluid and instrumentation interfaces at the pad. “Converting an active government launch site to commercial operation is substantially less complex and costly than the greenfield development of a new launch site, saving Firefly years of facility development and substantial [capital expenditure] dollars,” Obrocto said in the statement. He declined to disclose the cost of the renovation of the pad. Assuming the final Delta 2 launches on schedule, Firefly expects to take over the pad in time for a first Alpha launch in the third quarter of 2019. The company expects to be able to perform monthly launches of the vehicle by the end of 2020. Alpha is a two-stage vehicle using liquid oxygen and kerosene engines also under development by the company. The vehicle is able to place 630 kilograms into a 500-kilometer sun-synchronous orbit, accessible from SLC-2W. It can also place up to 1,000 kilograms into low-inclination orbits from other sites. That performance is significantly higher than many other small launch vehicles in development, whose payload capacities tend to be no more than a few hundred kilograms, and in some cases down to dozens of kilograms. “We think a one-metric-ton launcher is a sweet spot,” Tom Markusic, chief executive of Firefly Aerospace, said during a panel at the Satellite 2018 conference here March 12. Firefly is developing a second vehicle, called Beta, which is similar to the Alpha but with the addition of two first stage booster cores, analogous to SpaceX’s Falcon Heavy and ULA’s Delta 4 Heavy. Beta will be able to place up to 4,000 kilograms into low Earth orbit and 400 kilograms into geostationary orbit. While SLC-2W will be modified to also support Beta, the company hasn’t announced when it will be launching. “We are presently assessing market demand to determine the first launch date of the Beta vehicle,” Obrocto said. In addition to SLC-2W, Firefly is looking at other launch sites to reach low-inclination orbits. Obrocto said those sites include Cape Canaveral, the proposed Spaceport Camden on Georgia’s Atlantic coast, and the Mid-Atlantic Regional Spaceport at Wallops Island, Virginia. He said the company should make a decision “in the near future” on a site.